As you trek through a tropical jungle, your steps remain light and buoyant, never soggy. The rain forest floor is remarkably deep with layers of exotic coconut palm humus. It is cool and damp for several inches. Hold the richness in your hands, feel the soft silky texture. It’s the perfect medium for cultivating plants. The coir in Coco Loco behaves like little sponges making water available as needed by the plants. Coco Loco Potting Mix has the ability to hold more than its weight in water—while still draining well. Lower humidity reduces the possibility of attracting mold and root rot, as well as leaving insects less likely to bother your potted plants. Plants growing in Coco Loco will not require water as often as your usual potting mix. Whether you’re growing in hanging baskets, vertical gardens, containers, or seedling trays, extend your watering schedule. In most climates, every two to three days will be enough. Always adjust your watering schedule as needed. 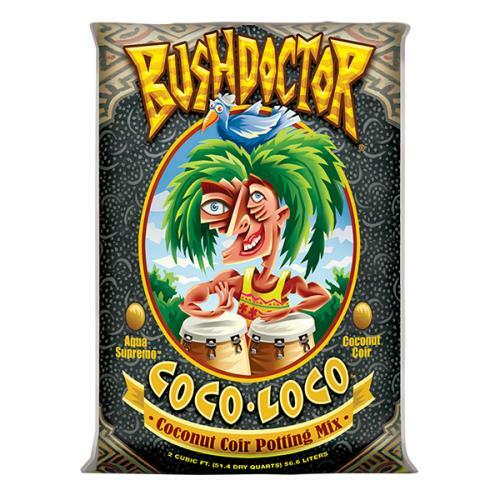 Coco Loco® Potting Mix has the ability to hold more than its weight in water while still draining well. The coir in Coco Loco® behaves like little sponges offering nutrients and water as needed by the plants. Lower humidity reduces the possibility of attracting mold and root rot, as well as leaving insects less likely to bother your potted plants. Now that’s Aqua Supremo! * Please call for pallet quantity.